When my fabricator finished the final adjustments based on the new bracket angle I measured, he did the finish welding and cleaned up the bracket. He ground additional clearance for the lower radiator hose. Here is the final fit test with the 90A alternator and the turn-buckle belt tensioner. The belt is ever so slightly mis-aligned to the plane of the crank pulley but I don't think it is enough to cause problems like throwing a belt. 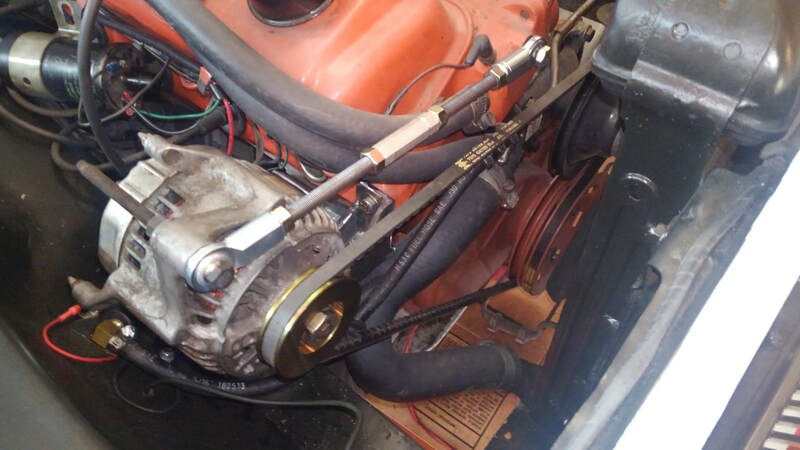 The stock belt nestles nicely into the new single-groove alternator pulley. One last item I needed to add was a plate that hangs down to mount the HEI coil to. After that I prepped the bracket for paint with a wire wheel and some Rust-Oleum rust converter black primer. The top coat is Krylon high temp engine paint in gloss black. The gloss black should add some contrast against the orange engine and aluminum alternator.